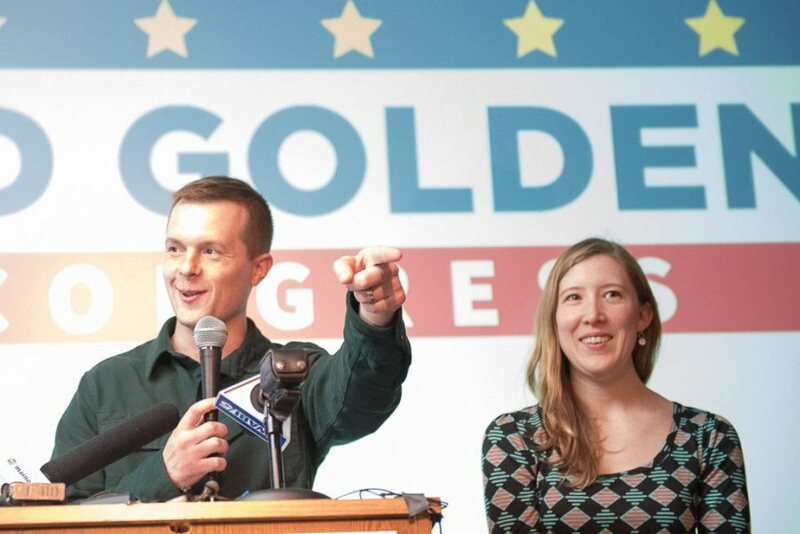 News outlets across the country reported Thursday’s breaking news that Jared Golden ’11, D-Maine, had won his razor-close election in Maine’s 2nd Congressional District in historic fashion. He becomes the second alumnus to win a House seat in 2018, joining Republican Ben Cline ’94, elected last Tuesday to represent Virginia’s 6th Congressional District. Golden’s election took more than a week to decide because neither he nor incumbent Bruce Poliquin got a majority, so the election was decided by Maine’s new ranked-choice voting format. Golden is the first candidate to unseat an incumbent in the 2nd Congressional District in over 100 years. Golden, a native of nearby Leeds, served in the U.S. Marines in Iraq and Afghanistan prior to entering Bates, where he majored in history and politics. Since 2014 he has served in the Maine House of Representatives, representing part of Lewiston. The two Congressmen-elect become the eighth and ninth Bates alumni to serve in the House since the college was founded in 1855, and the second time two Bates alums have served in Congress together. The first was between 1933 and 1935, when Carroll Beedy and Donald Partridge, both Republicans, represented Maine’s 1st and 2nd districts, respectively. NBC News featured the Rev. Marshall Hatch Jr. ’10, a youth minister at New Mount Pilgrim Church in Chicago’s West Garfield Park neighborhood. Hatch founded the Maafa Redemption Project, a residential program for young African American men. The story by NBC Left Field, the experimental video unit of NBC News, says that West Garfield Park has a far lower life expectancy, due to poverty and violence, than downtown Chicago. “When you look at all the social determinants, it’s because it’s a food desert, it’s because it doesn’t have high- quality education, it’s ridden with gun violence and drug infestation,” says Hatch, who earned graduate degrees at the University of Chicago after majoring in politics at Bates. In response, Hatch created the Maafa Redemption Project (maafa is a Kiswahili word that means “great disaster” and refers to the transatlantic slave trade) to give young men stable housing, mentors, job training, and identity and purpose development, and, in turn, to strengthen their communities. According to NBC, more than 90 percent of Maafa Fellows subsequently enroll in community college or work in construction. In exploring the drastic disruption climate change has wreaked on the Antarctic Peninsula’s animal populations, National Geographic’s Craig Welch talked to Doug Krause ’99 and Ari Friedlaender ’96, experts on leopard seals and humpback whales, respectively. As sea ice melts and leopard seals have fewer floes to rest on, they’ve moved closer and closer to land, where they attack and decimate fur seal populations, Krause said. 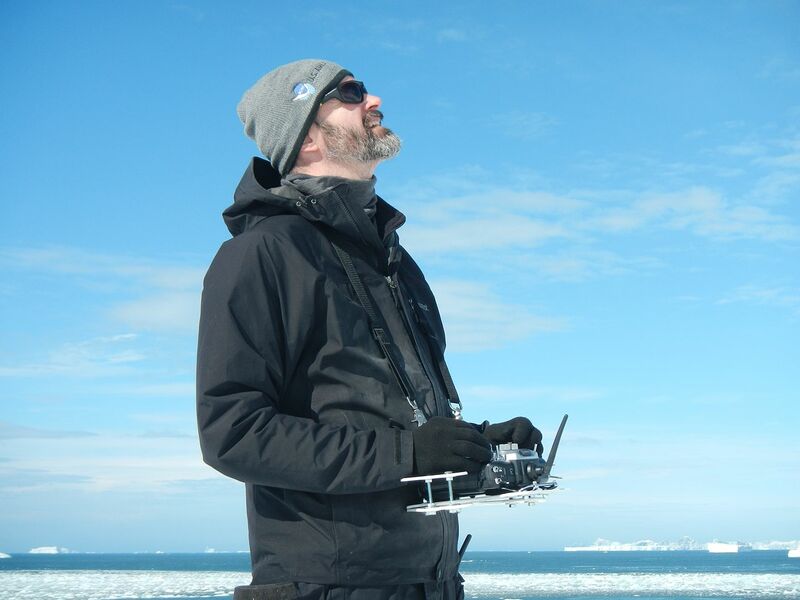 Melting sea ice is actually better for humpback whales, said Friedlaender, who’s made dozens of trips to Antarctica since the late ’90s — they have more open ocean and more time in which to hunt for krill, fueling a population boom. 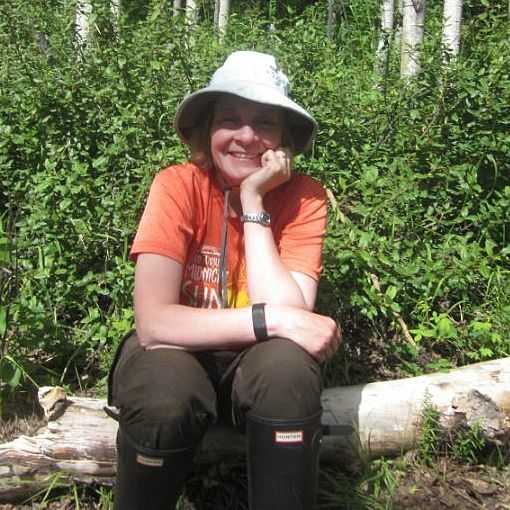 David James of the Fairbanks, Alaska, Daily News-Miner profiled Christa Mulder ’88 as part of a series on immigrants in Alaska. A native of the Netherlands, Mulder grew up there and in Brazil and Colombia. She majored in biology at Bates; earned a master’s in Ontario and a doctorate at the University of Alaska–Fairbanks, and has had academic jobs in Sweden, New Zealand, and, finally, back at the University of Alaska, where she’s a professor of plant ecology. Mulder says her globetrotting has given her helpful life skills. “I learned to make friends with people of all different ages, and I also became very flexible,” she told James. The Daily Evergreen, Washington State University’s student newspaper, covered the opening of Kate Gilmore: In Your Way, an art exhibition that shows women moving into labor-intensive, female-dominated spaces. The exhibit, which was first shown at Bates, consists of “nine videos that are performance-based and a new piece that welcomes the public to use a sledgehammer to make their mark on five steel fabricated cubes,” wrote reporter Madysen McLain. “I want the audience to engage in the piece, physically and emo­tionally, and I want to remove myself from the work,” Gilmore told The Daily Evergreen. 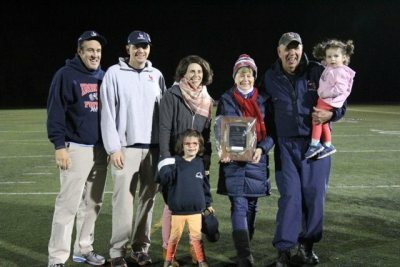 Newspapers throughout Massachusetts, including The Boston Globe and Boston Herald, reported a Tom Lopez ’69 milestone: On Oct. 19, he won his 300th career game as the longtime head football coach at Lincoln-Sudbury Regional High School. 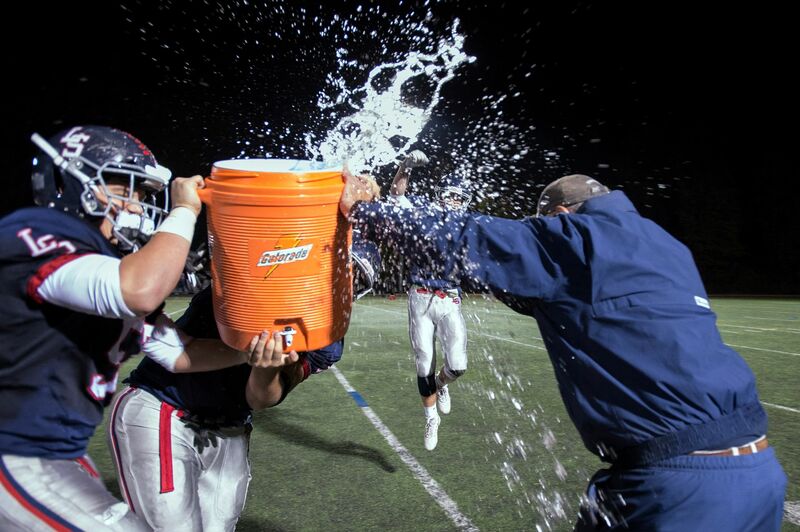 Lopez is just the fifth high school football coach in Massachusetts to win 300 games, according to MetroWest Daily News. Following the win against Wayland High School, more than 200 friends and well-wishers unfurled a banner and donned commemorative hats, Globe reporter Jake Caccavaro wrote. An outstanding end at Bates, Lopez won his first game as a head coach 40 years ago, on Oct. 14, 1978, in his first season as varsity coach. He has since led the school to seven Massachusetts Super Bowl appearances and 18 Dual County League titles. Lopez deemed the celebration “very neat,” but told the Globe that his main takeaway from the victory was his team’s higher seed in the upcoming playoffs. Lopez, who was featured on the Bates Bobcast following the victory, recalled being “very fortunate” to play under coaches like Bob Hatch, Bob Flynn, and Chick Leahey ‘52 at Bates. On her blog, author and editor Deborah Kalb interviewed Mary Morton Cowan ’61 about Cowan’s new children’s book, Cyrus Field’s Big Dream: The Daring Effort to Lay the First Transatlantic Telegraph Cable. The book, written for middle-grade readers, tells the story of Field, who spearheaded the effort to lay a cable from Newfoundland to Ireland — only to see it break down just a few weeks after going live. “I’d like young readers to get a glimpse of a persistent man, and to realize that they too can dream, can aspire to achieve lofty goals, and with perseverance, can achieve them,” Cowan told Kalb. Seacoastonline reported that Lucy Brennan ’14 was hired as an AmeriCorps VISTA volunteer to help the town of York, Maine, study energy data and develop clean-energy policies. An environmental studies major at Bates, Brennan will collect energy use data, create a model using that data, and recommend policies. She is also the sustainability program coordinator for the city of South Portland, Maine (where she works with sustainability director Julie Rosenbach, who formerly did that job at Bates). Eric Chasalow ’77, the Irving Fine Professor of Music at Brandeis University, took Brandeis’ media relations director Julie Jette and videographer Tarah Llewellyn on a tour of the school’s campus, with a particular eye on the abundance of mushrooms growing there. A biology and music major at Bates, Chasalow dedicated his professional life to the latter but has an abiding interest in mycology (the study of mushrooms) and foraging. 2018 was a bumper year for the fruit of the fungus; “Chasalow has seen varieties he never spotted before,” wrote Jette. For Chasalow, “walking and seeking help him create a mental space that helps fuel the creativity needed to compose complex works of art,” Jette wrote. At Harvard, she is the Barbara Gutmann Rosenkrantz Professor of the History of Science, professor of African and African-American studies, and chair of the department of the history of science.